The property was very clean and quiet. I didn’t like that I couldn’t get my receipt once I checked in or checked out. The office was closed upon checking out!! Where to find Virginia Beach hotels near an airport? 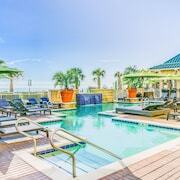 How can I find hotels in different Virginia Beach neighborhoods? Where can I find hotels in Virginia Beach that are near tourist attractions? Visitors to Coastal Virginia are simply spoiled for choice when it comes to booking the perfect places to base yourself in Virginia Beach. The Expedia database lists 74 accommodation options within a 0.1-kilometre (0.1-mile) radius of Virginia Beach's central area. 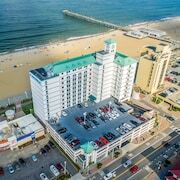 Virginia Beach offers visitors a number of convenient lodgings, such as the Hilton Virginia Beach Oceanfront and Courtyard by Marriott Virginia Beach Oceanfront South. Ocean Breeze Waterpark and Virginia Aquarium and Marine Science Center are popular Virginia Beach, attractions, and many visitors choose to stay nearby. The Ocean Key Resort and the SpringHill Suites by Marriott Virginia Beach Oceanfront are among the options that are near Ocean Breeze Waterpark. The Fairfield Inn & Suites by Marriott Virginia Beach Oceanfront and the Country Inn & Suites Virginia Beach are near Virginia Aquarium and Marine Science Center. 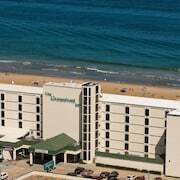 The hotels closest to the Neptune Statue are the Holiday Inn & Suites Virginia Beach North Beach and Courtyard Virginia Beach Oceanfront/North 37th Street. The Hampton Inn Virginia Beach-Oceanfront North and Comfort Inn & Suites Virginia Beach are near to Jungle Golf.â€¨ Hotels close to the Atlantic Wildfowl Heritage Museum include the Holiday Inn Oceanside- VA Beach and Sheraton Virginia Beach Oceanfront Hotel. Alternatively, if your focus is on Pacific Place, your closest hotel options are the Ocean Suites and Ocean Sands Resort. 13 kilometres (8 miles) away from the main part of Virginia Beach, is the Church Point Manor. 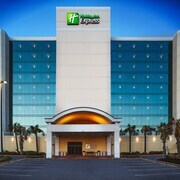 The Holiday Inn Express Hotel & Suites Va Beach Oceanfront is located 0.2 kilometres (0.1 miles) away. You could also make a reservation at the Residence Inn by Marriott Virginia Beach Oceanfront or the Best Western Plus Sandcastle Beachfront Hotel. After you have spent some time in Virginia Beach, take the time to explore Coastal Virginia's other scenic and cultural delights. Coastal Virginia has beaches and coastal plains. Commonly visited Coastal Virginia tourist draws are history museums and open-air museums. In this section of United States of America, tourists can try their hand at hiking and horse riding. Spend a few hours discovering the Chrysler Museum of Art and the Norfolk Botanical Garden in Norfolk - Virginia Beach, 19 kilometres (12 miles) to the west of Virginia Beach. Some of our recommended Norfolk - Virginia Beach accommodation options include the Homewood Suites by Hilton Virginia Beach/Norfolk Airport and Residence Inn by Marriott Norfolk Airport. 30 kilometres (19 miles) to the west of Virginia Beach is Portsmouth, which is home to the Norfolk Waterside Marriott and Residence Inn Norfolk Downtown. The Children's Museum of Virginia and the Portsmouth Naval Shipyard Museum are a couple of the popular sites to check out when you're in Portsmouth. Norfolk International Airport is a convenient airport for arriving in Virginia Beach. It is 20 kilometres (12 miles) drive away. If you plan to stay nearby, try the Best Western Plus Holiday Sands Inn & Suites or Holiday Inn Express Hotel & Suites Norfolk Airport. What are the most popular Virginia Beach hotels? 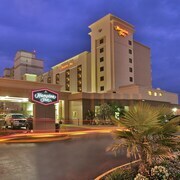 Are there hotels in other cities near Virginia Beach? 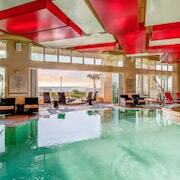 What other types of accommodations are available in Virginia Beach? Explore Virginia Beach with Expedia.ca’s Travel Guides to find the best flights, cars, holiday packages and more!